The weather has been so weird this year! 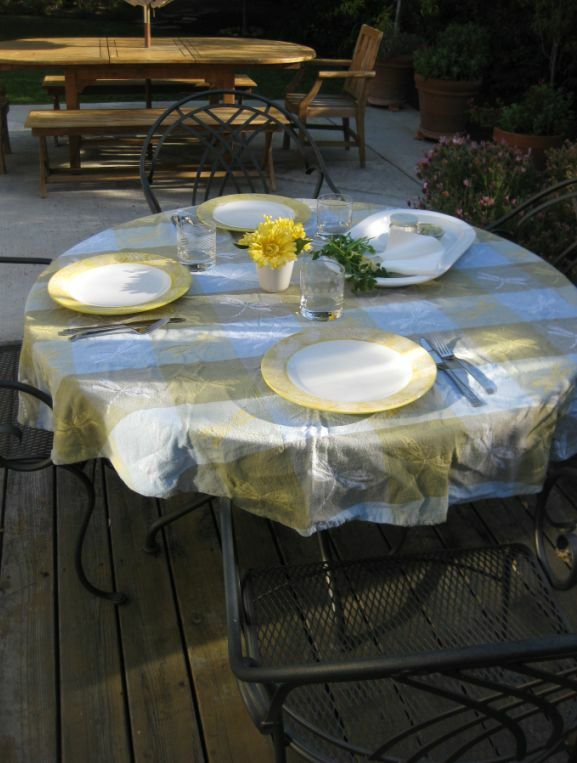 It has been overcast, rainy and somewhat cold but this weekend the sun is out and it so nice to hang out in our garden. I told Hoa and Kevin we should enjoy the weather and have a BBQ today. 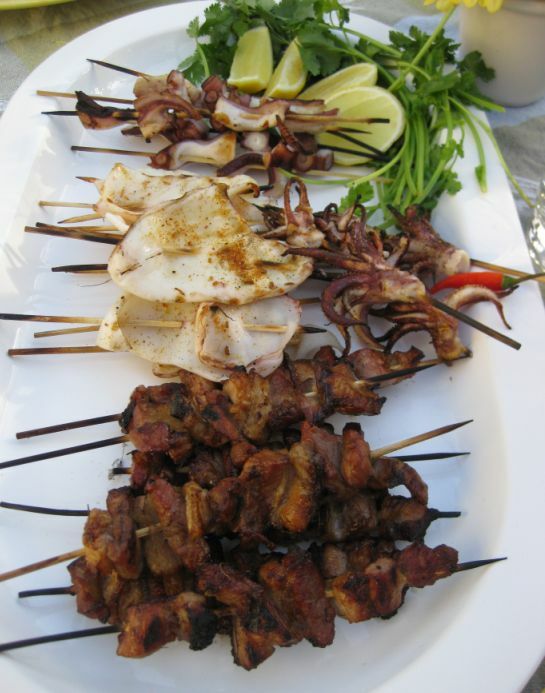 I am putting on the grill BBQ pork Belly skewers, spiced calamari skewers, and Octopus skewers. 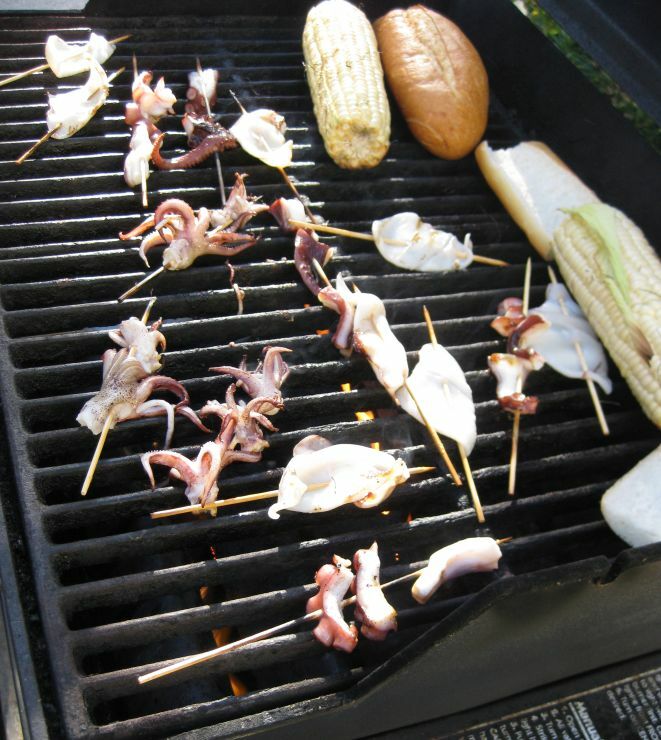 Over view of my grill platter. 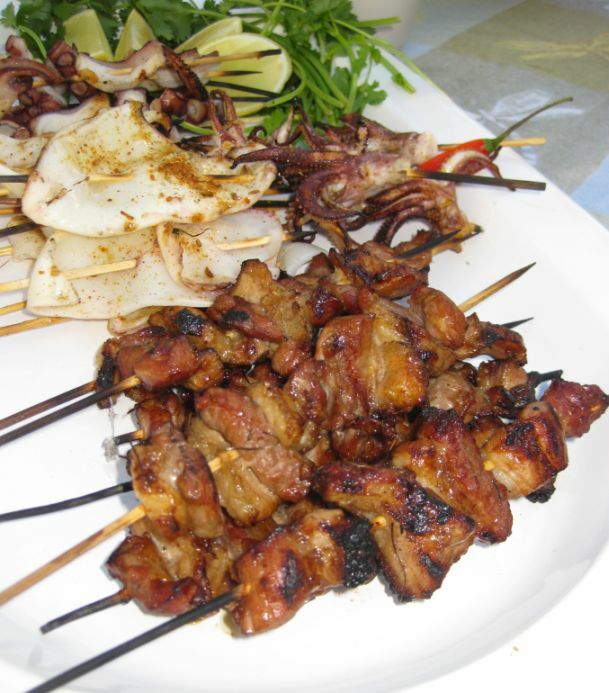 Lately, we have been dinning at Tanto, a Japanese restaurant and they served the tastiest BBQ pork belly. While eating them I thought to myself that I can probably made them at home so I decide it to give it a try. To my surprise they came out to be so tasty. I will definitely make them again and again... I can't get enough of them. I think Kevin ate at least 4 skewers and he loves them. 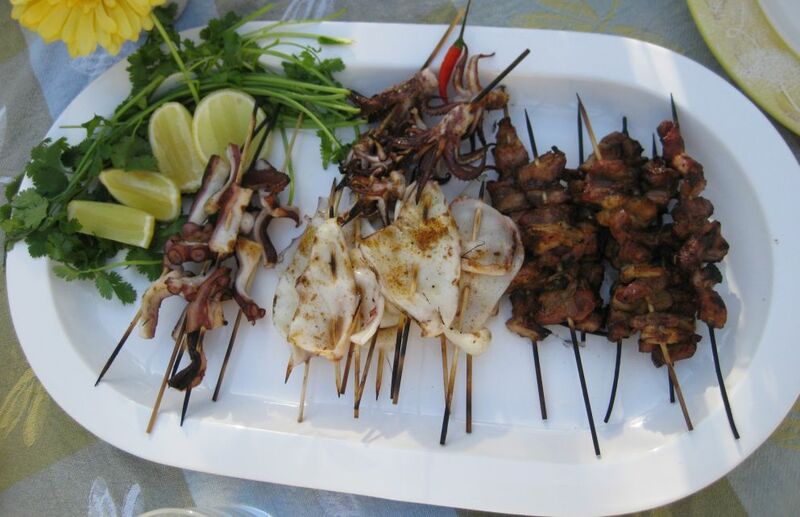 Appetizing platter of mix grill! 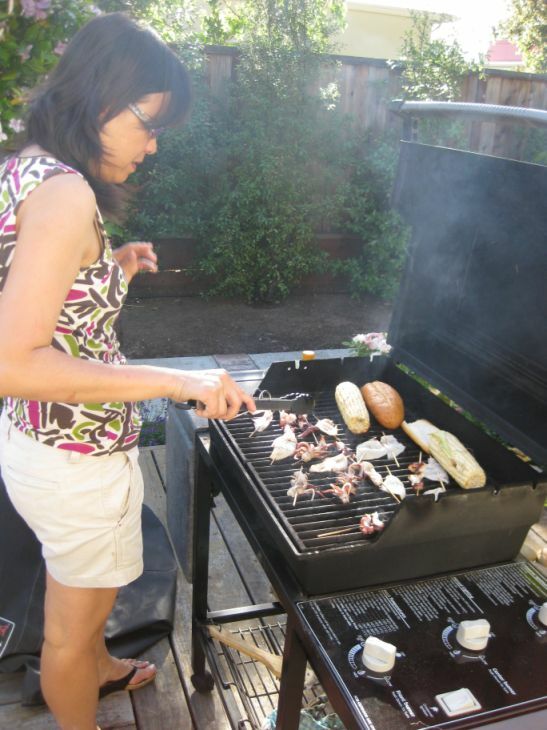 Hoa did a wonderful job grilling the BBQ pork belly. The top layer had a nice caramelize layer with a soft interior... so tasty! 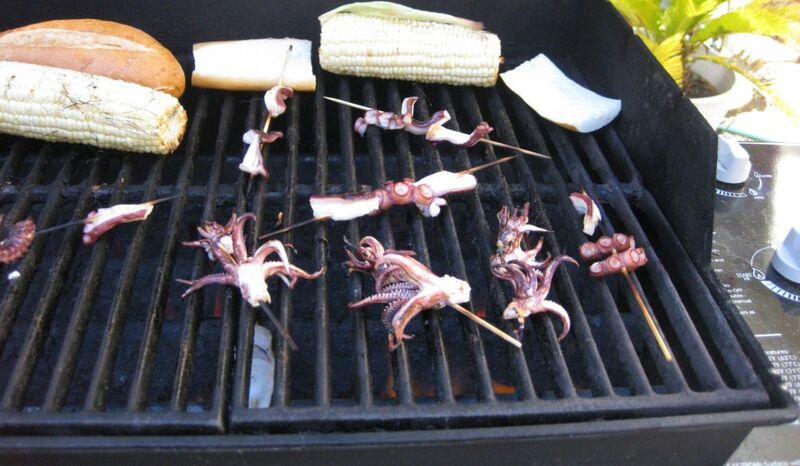 I have never grill octopus before but they turned out to be delicious as well. 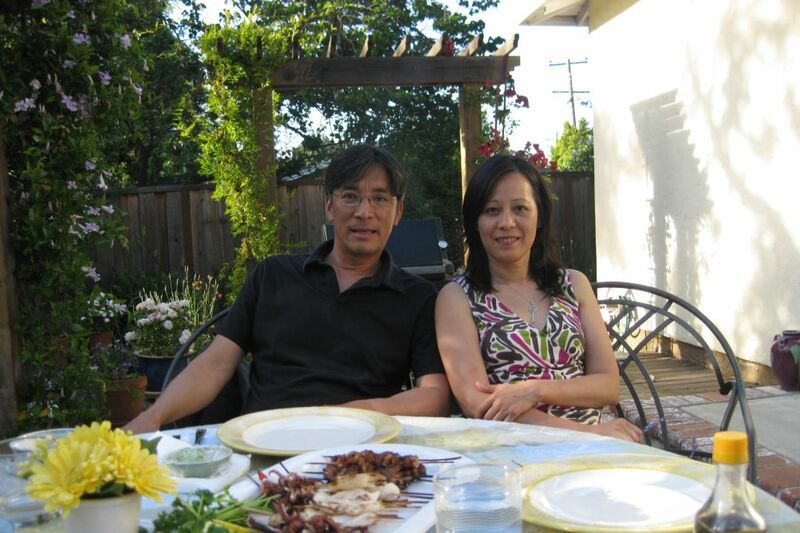 Hoa and I ready to enjoy our meal in our garden. Put all the spice ingredients in a spice mill or coffee grinder and grind to a fine powder. Mix all the ingredients together and taste it to your liking. 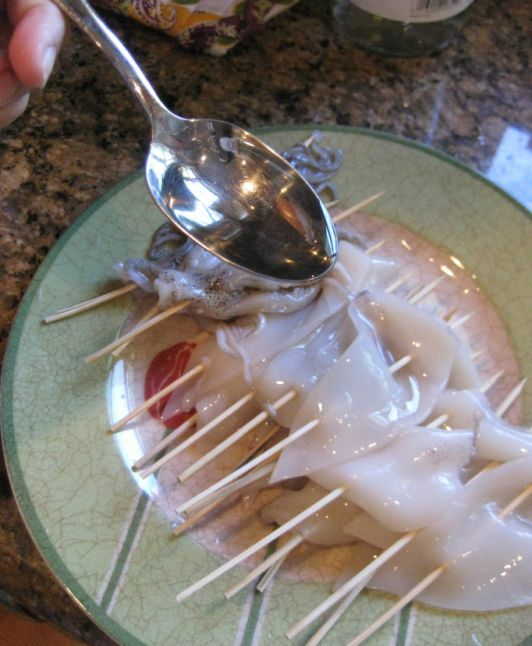 Rinse the calamari tubes under cool water and pat dry. 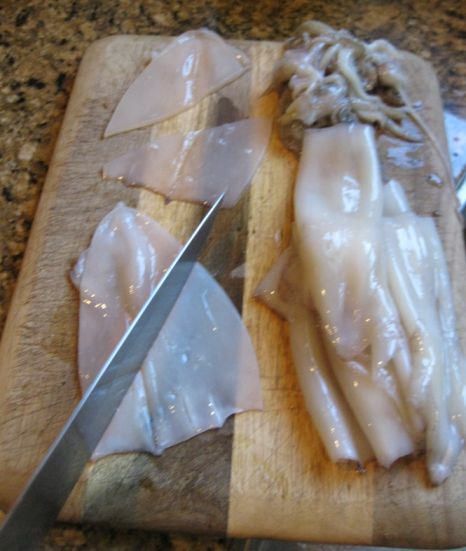 Split the bodies from top to bottom so you have 2 triangular pieces from each calamari. Thread a skewer trough the length of piece. 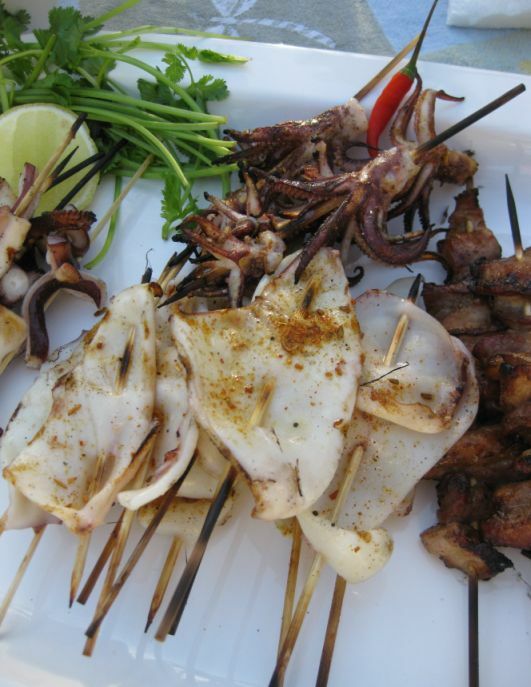 Drizzle with oil on the calamari and set aside. 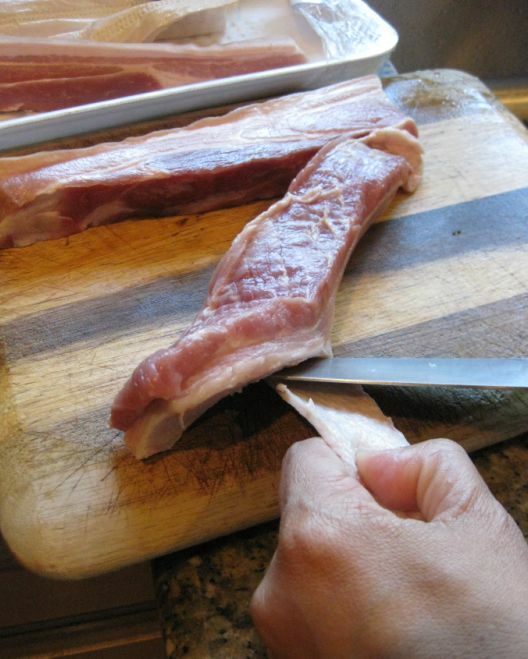 Cut the off the skin of the pork belly. 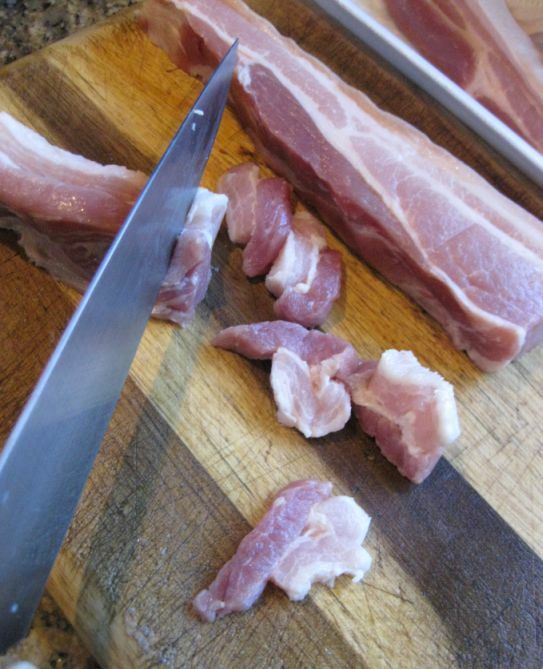 Cut the pork belly into 1/4 to 1/6 inch thick. 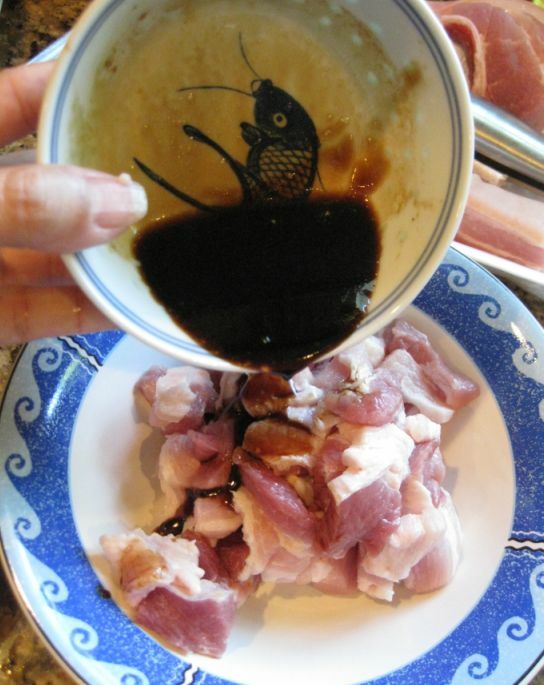 Pour the soy marinade over the pork belly and let it rest for about 15 minutes. 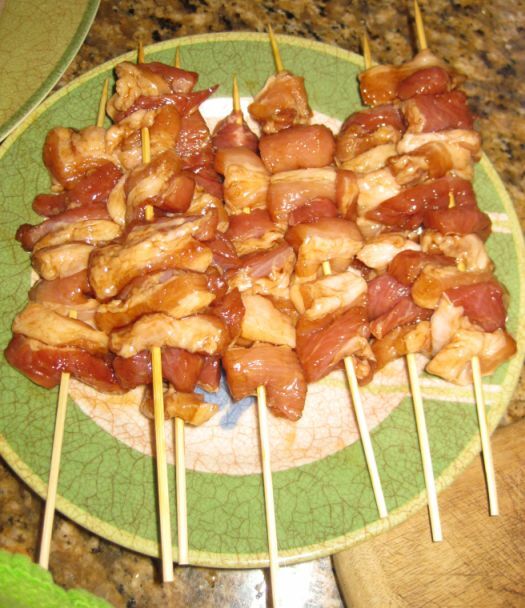 Thread about 5 pieces of pork belly per skewer and set aside. 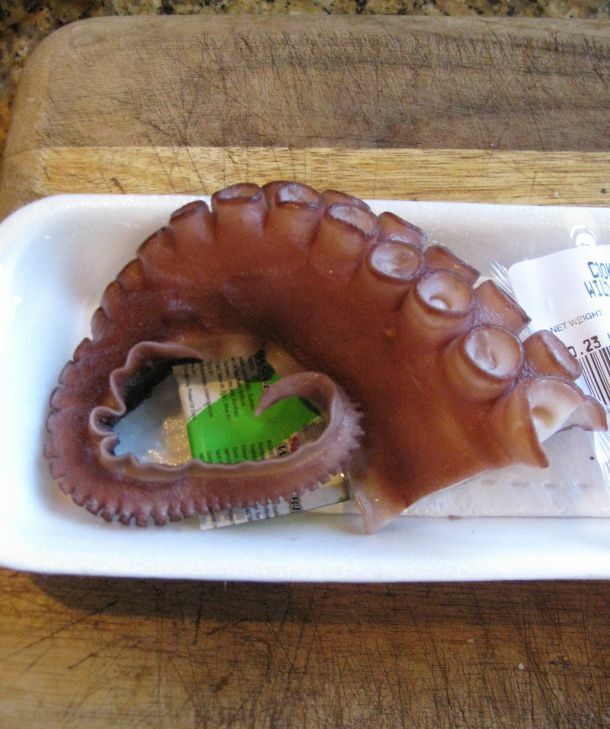 I bought a piece of Octopus that is already cooked at Ranch 99. 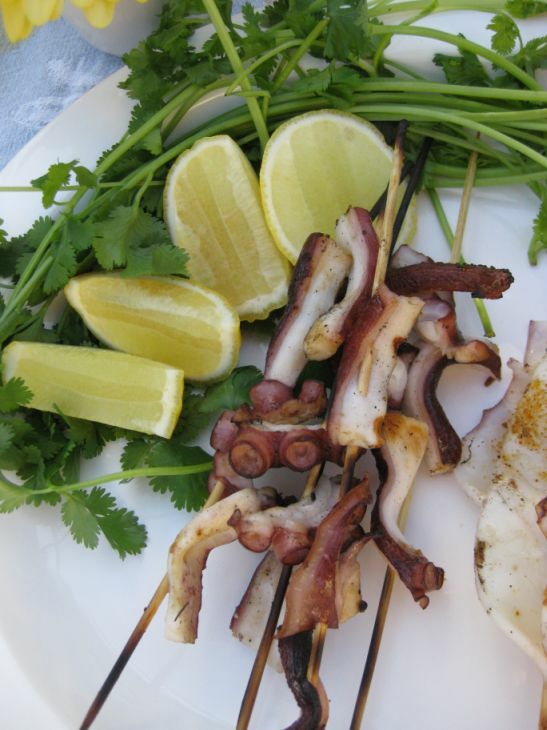 Slice the Octopus and then tread them into skewers. 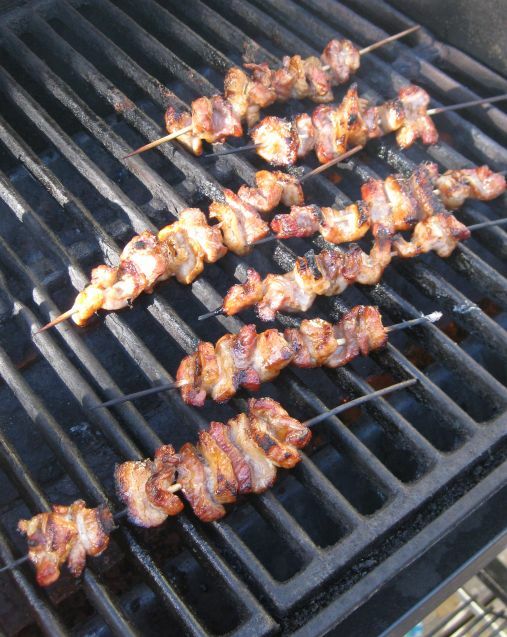 On a medium heat grill the pork belly skewers and when the meat is cooked crank the heat to high so you get a nice caramelize layer. 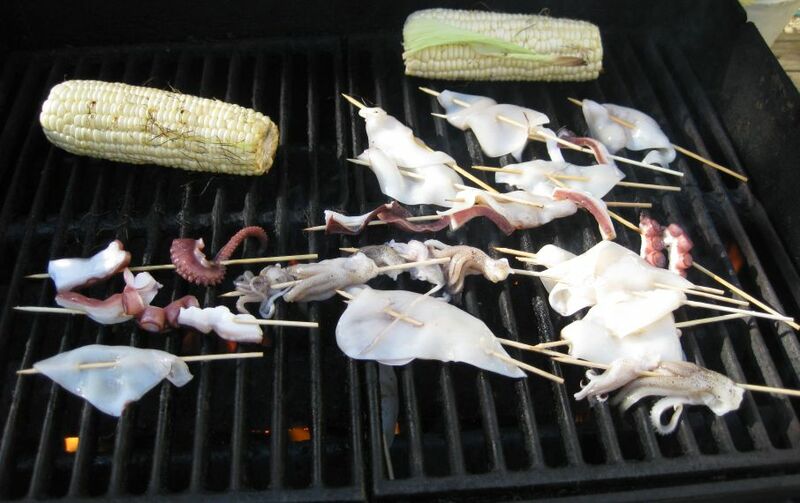 Next, I am grilling the calamari, octopus and white corn. 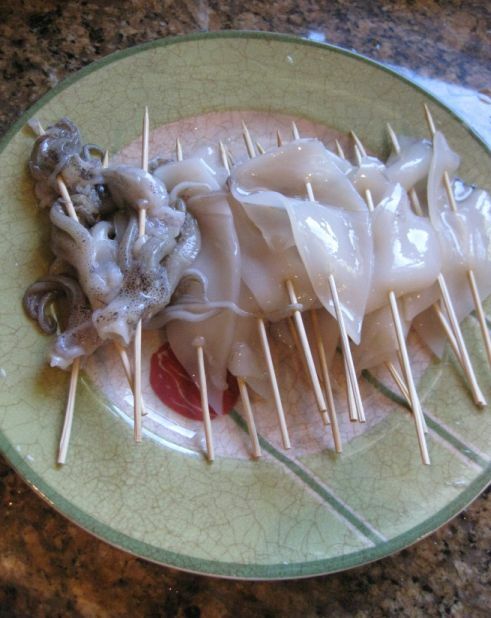 The calamari only takes about 2 minutes per side. Any longer than that they will get rubbery. 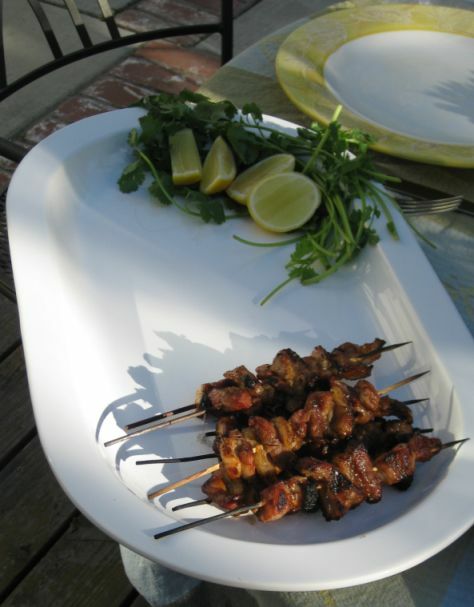 Platting the pork belly skewers. 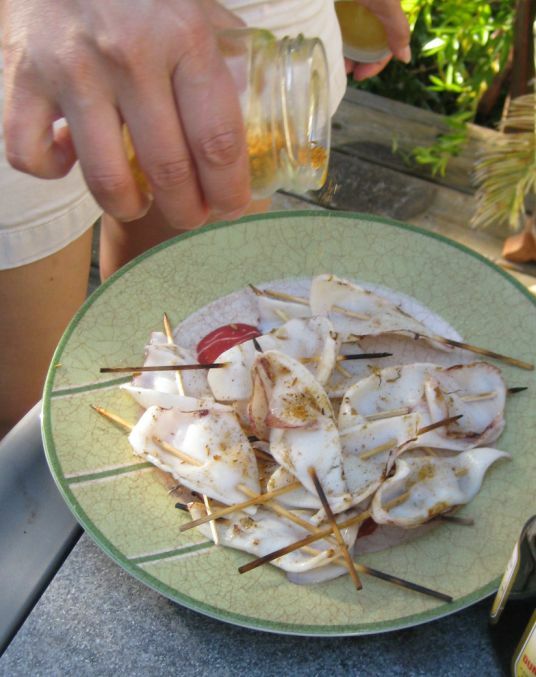 Sprinkle the curry spice mix on the calamari and squeeze the lime or lemon on top. 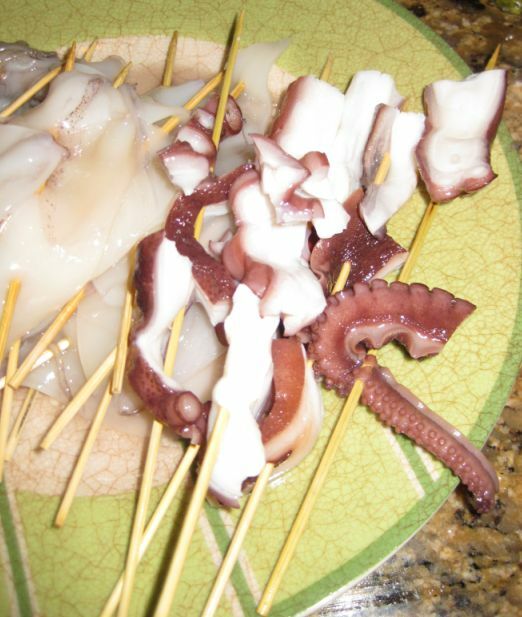 The octopus takes about 2 minutes per side so you need to watch it. 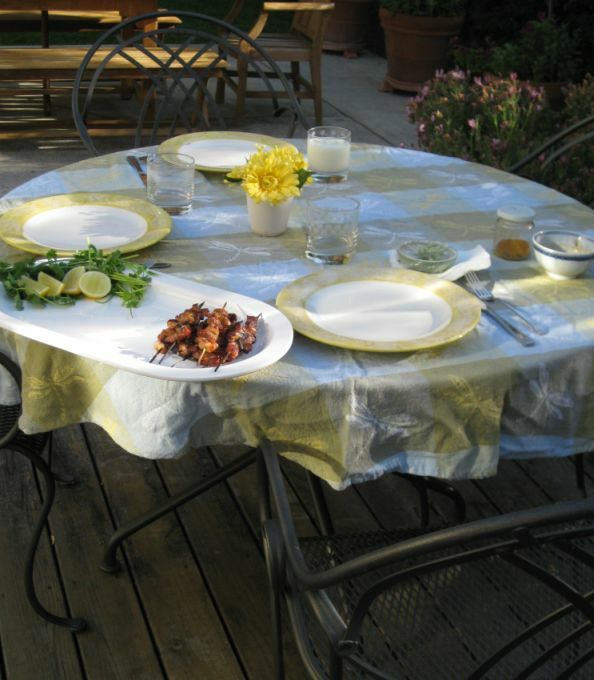 Setting up the table so we can seat down and have dinner.